Cotton is a natural fiber used to make fabric, which is then made into clothing. Cotton has been used to create clothing for at least 7,000 years, and is used worldwide because of its trademark lightness, softness and breathability; cotton is the world's most commonly used natural fiber. Today, cotton is grown in 85 countries around the world and uses 2.5 percent of the world's arable land. Among cotton growers around the world, China is the largest producer of cotton, but uses most of the product grown in the country. The second-largest cotton producer is the United States, where between 40 and 60 percent of the cotton produced is shipped abroad. Of the cotton produced, an estimated 60 percent is used to make yarn or thread, which is then turned into fabric for clothing items, such as t-shirts, shirts, jeans, coats, and jackets. According to Cotton Inc, 60 percent of women's clothing items contain cotton fibers, and 40 percent of women's clothing items are made from all cotton. 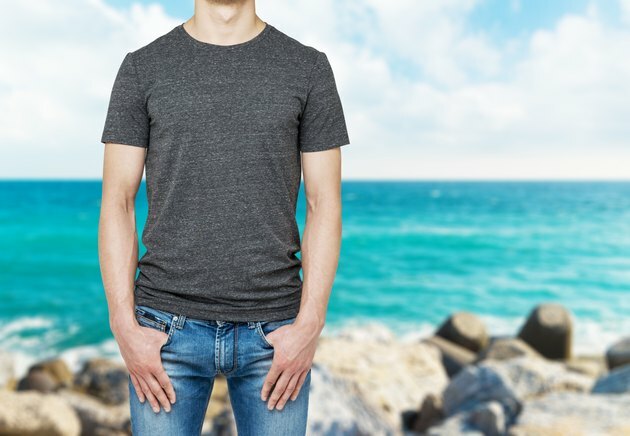 Among women's clothing items, 75 percent of summer wear items contain cotton, while only 60 percent of winter wear does, proving that cotton's light and breathable feel are what make it so essential for dressing during summer months. Among specific clothing items, 30 percent of women's dress pants contain cotton, 38 percent of women's dresses contain cotton, 45 percent of women's skirts contain cotton, and 48 percent of women's knit blouses contain cotton. Seventy-five percent of men's clothing contains some kind of cotton blend. Of the men's clothing made from cotton fibers, 85 percent is made from 100-percent cotton. Cotton is used to make men's cotton suits, cotton dress shirts, underwear, and men's casual clothing, including jeans and sweatshirts. Cotton's absorbancy and breathability make it a suitable fabric for wearing in warm weather conditions; the use of cotton in men's suits and shirts makes for comfortable business wear.